A few years ago I had baptismal studies with an elderly man named Oscar. He had just come to the United States from Guam but was actually already a U.S. citizen before ever stepping on American soil. Guam has its own government, but is an unincorporated United States territory. This gave Oscar the opportunity to become a U.S. citizen before even setting foot on U.S. soil. I had never heard of someone being a citizen of a Country they had never been to before, but then it occurred to me that all Christians are citizens of a land they have never been to before. This world is not our home. The fact that the world is not our home could account for why we do not always fit in. It could explain why the world cheers at things that break our hearts, and why we sometimes cheer and the world does not cheer with us. Have you ever followed your favorite sports team to a road game? It is a totally different experience than when you are watching them play at their home stadium. When you are on the road you stand up and cheer when your team scores, but you cheer alone because everyone else is for the home team. And when something happens to make the home crowd cheer, you just sit there. Everything seems backwards when your team is playing on the road. 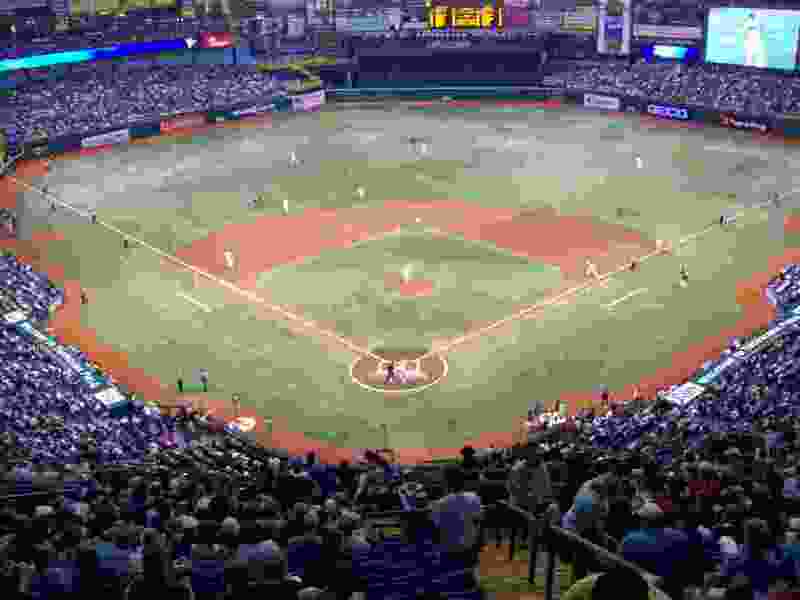 I have been to several Tampa Bay Rays baseball games over the years, but one time in particular, I went with some friends from church to The Tampa Bay Ray’s stadium, Tropicana Field, where we watched the first place Rays defeat the second place Red Sox 2-1. It was a great game and the Rays did not win it until the bottom of the ninth, when our catcher, Dioner Navarro hit in the winning run. While at the game I noticed several Red Sox fans. You could easily spot them with their Red Sox shirts, caps, and jackets. I even sat by one. He assured me that the long fly that Ortiz hit to deep right center for an out would have been a homerun at Fenway Park, where the Red Sox play their home games. I noticed something about the Red Sox fans. They came into our home ball park but still dressed and acted like they would at Fenway, their home ballpark. They did not buy the Tampa Bay Rays t-shirts and caps and try to blend in at all. 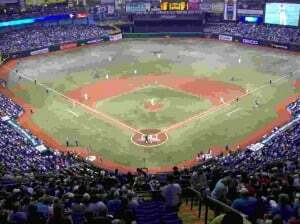 While most of them were very polite and pleasant to be around, they still made it clear that Tropicana Field was not their home, and the Rays were not their team. They did not mind looking like visitors. They did not mind that they dressed and looked different than the rest of us. They were proud of their team and where they were from. They did not cheer when we cheered. They did not mind standing out in the crowd and looking and acting different. They dressed and acted in Tropicana Field, they same way they would dress and act at Fenway Park. Do we dress and act here on this earth, the same way we would dress and act in God’s kingdom, where we belong? As Christians, let’s let the world know earth is not our home. While being as polite and pleasant to be around as possible, let it be known that our home is in heaven, not here. We do not blend in with the world because we are not a part of this world. Let’s not be afraid to look different and act different. Let’s be as proud of where we belong as the Red Sox fans were proud of where they belong. According to the free online dictionary, a pilgrim is one who embarks on a quest for something conceived of as sacred. Christians are likened to pilgrims. We are on our journey home. Though sometimes we forget and build permanent camps, we ought to remember that we are pilgrims headed to our permanent home. In our pilgrim journey, we may need a brother to pinch or wake us up when we fall into “spiritual stupors.” Praise the LORD for such brothers who keep us on track. Sometimes the cares of this life slow us down, making us forget what we are all about and where we are going. Below is summary of characteristics of pilgrims. If we cannot find ourselves in the midst of these characteristics, then we may not be on a “pilgrimage” at all or perhaps we’ve fallen into a “spiritual stupor” and we need a brother to give us a spiritual pinch, so we can get back on the band wagon. Noah is another example – He received a call to build what would be a “costly” ark, he obeyed and undertook this expensive investment by faith (Genesis 6:22). Abraham is an example – When he reached Canaan, he did not possess it. For the rest of his life, though in promise it was his, he lived in the country like a foreigner (Genesis 12:1-3). At the time of his death, his only possession in the land was the plot of ground that held the bones of his wife (Genesis 23:3-20; 25:7-10). What about you my brother/sister? Are u treating this world as if it is the only friend u have? Are u trying to gain it all at the expense of your soul? Abraham is an example - There were many cities in Canaan but he lived with the conviction of what was unseen. He waited for the eternal city which possessed an immovable foundation (Revelation 21:14, 19-20). He eagerly longed for this city which Jesus described as a good place for treasures (Matthew 6:20). John described it as a place that reflected the glory of God, and as a place for all who believe and are obedient(Revelation 21:22-27; 22:14). If Christ would be in the US during His 1st advent, He could have used this same parable to illustrate the kingdom of God. Praise God, stay blessed bro.William so Gods Spirit can keep using and inspiring you to make the gospel clear and simple. Was it not this same earth created for us? What i think you should have highlighted is that our behavior reflects that of a Christian. We are on a spiritual journey with our minds set on Heaven to be with Our Lord and Savior , we are to follow in His foot steps , and mirroring Him now. This is what sets us apart from as Being on the Home team. Our character, our integrity, everything just doesn't resemble the worlds behavior , but earth was originally created for us. Not just that man was placed on this earth by God initially but after a period of time God will create a new earth and the saved will return to call this place home. However, as long as Lucifer claims the earth for himself, the saved are not at home and should live "separately" with our hearts and minds set on God's ultimate home.